Matt uses the Axe FX for his effects and the Kemper amps to take care of the amp modeling. Since Songs of Innocence, the Edge has been using 4 of these in his rack rig. "I used to have what was the size of refrigerators for racks with all sorts of gear because back then there was only one thing that did the chorus, one thing that did delay, and one thing that did phase. So then multiple processors came along and most of them sounded like crap to me. They were like toys. The people weren't really putting in the technology into them. A lot of times this is like a playground for the intellect of a geeky designer. So you get gear that's impossible for a musician to figure out and doesn't sound good. I went through a lot of that for many years. And then I found this. Well, I mean I didn't find it - it found me! It's a very popular device. Out of any device I've ever used - any effects processor - for my ear this seems to have the most transparency which means its sounds the most like just plugging directly to the front of an amp which is really nice. It's extremely powerful! It's almost like rocket science. I mean, you have to learn how to use it. I mean you can just plug it in and and put up some settings and it's good, but when you start getting into all the parameters of it you can give yourself a hernia with just pushing buttons, haha. That's basically what I use. Now I don't necessarily use it very much on the record because when I record I like to get a very direct signal and then I put various processors from inside, but I did use it on some stuff. This is my rig to use live," says Steve Vai about the Fractal Audio Systems Axe-Fx II Guitar Effects PreAmp Processor. "With the amp in the effects loop is actually the Axe-FX II, which we just started using. We were using the Ultras before. The guys from Fractal took all my programs from the Ultra, and [John] only uses one preset, it's all of the effects just kind of like you would have in any other system - delays, choruses, whatever - and we just turn them on and off. They're set, they don't change. So he programmed everything into the Axe-FX II, came out, we put it in the rig and sat there and kind of had to go through stuff and tweak things a little bit. So with the Axe-FX II, the outputs, left and right, come into the effects return. The top amp would be the left side and the bottom amp is the left side, so we get a true stereo thing happening. His effects chain is just very, very simple. Everything is in parallel with the main line of it, so there's nothing too crazy going on," says John Petrucci's guitar tech. "**Effects** Fractal Axe-Fx II Vox Joe Satriani Big Bad Wah DigiTech Whammy Fulltone Octafuzz MXR EVH Flanger"
This source is given in the rig rundown video. According to Syn's guitar tech, he has two Axe-FX II units in his FX loop (presumably one as a backup). He discussed Syn using them as harmonizers, though no other effects were mentioned. In this picture you can see that Dave Weiner uses the Fractal Axe-Fx II Guitar Effects Processor. In this rig rundown video, Brad's guitar tech says that he uses Fractal Axe-Fx II around 0:35. Hetfield: We’re really pleased with Fractal. It’s amazing. For my rig, we went into the studio and put some sounds into it—a combination of my Mesa/Boogie amps mixed in with a little bit of my Diezel sound. The clean sounds are from the Roland JC-120. On stage, Mesa 2:Ninety power amps drive my cabinets, but those cabs aren’t miked at all. They’re only there for my monitoring, for getting feedback, and for just feeling it. The Fractal is going direct to the board. At 4:21, Troy says about the Axe-FX II "Actually, I've gotten quite used to the Fractal. It sounds great, actually. Once you get into all the parameters of all the effects, you can actually make it sound pretty good, pretty much custom." He says later at 5:27, "I'm really using the Axe-FX for reverbs and tap delays. I actually use it also for a sort of like a Uni-Vibe sort of wobbly effect. I also use it for routing stuff to different amps." "All of my delays and reverbs and everything else goes through the Axe-FX II." - James Valentine in this "Rig Rundown." As of 2:30 in this video, Devin talks about the Fractal Axe-Fx saying "I have got a very hodgepodge set-up currently that I am experimenting with and the centre of that is Fractal. And I have been using the Axe-Fx now for [...] four years since the Ultra." The unit can be seen at 2:36. "Myung uses a Shure UR4D wireless. From there the signal goes into a switcher, then to a Radial JD-7 splitter that splits into three signals. The first goes straight to a Demeter Tube DI, while the second goes through a Demeter Optical Compressor, Demeter Preamp, then Demeter VTHF-300M into a Radial JDX speaker simulator. The third output goes into the Fractal Audio Axe-FX II, which handles overdrive, chorus, reverb, and any other effects processing," states [this](http://www.premierguitar.com/articles/Rig_Rundown_Dream_Theaters_John_Myung) rig rundown article, by Premier Guitar. In [this](http://www.premierguitar.com/articles/Rig_Rundown_Bushs_Chris_Traynor) Premier Guitar rig rundown, it states, "Traynor uses a duo of Fractal Audio Axe-FX II units, which he's used since the company's very first iterations of the units." At 0:36 in this rig rundown, Monte mentions that he uses Fractal Axe-Fx II. Around 12:22, Nickelback's guitar tech shows the Fractal and talks about how Ryan uses it during concerts. Ken Andrews uses this as it "sounds good with bass & guitar" for his alternating between the two instruments, along with finding it easier to take on tour rather than taking multiple amplifiers to get the Failure sound, according to [this](http://www.premierguitar.com/articles/21068-rig-rundown-failures-ken-andrews) Premier Guitar rig rundown. Both Greg and Ken praise the fractal for its convenience and sound quality in the Premier Guitar's interview about Failure's new album. Howerdel: "I turned on my rig with all the patches for APC, and it just didn’t work. Even in 2004, my stuff was kind of old and not working correctly. So I just scrapped it all and started from scratch. I’ve got my Fractal, but I also kept an older box that’s barely working: the Lexicon MPX G2. I still haven’t heard anything that sounds quite as good, but it’s just so unreliable." "We started using new effects. We’re both using Fractal Axe-FX IIs. We wanted to get some of the original sounds back, but also see if we could make things bigger, crazier, or more exaggerated than the original effects," says James Iha, in [this article](http://www.premierguitar.com/articles/19970-a-perfect-circle-another-round-for-billy-howerdel-and-james-iha?page=2). At 9:43 of this Rig Rundown for Bill Kelliher [Lethargy](http://equipboard.com/band/lethargy), [Today Is The Day](http://equipboard.com/band/today-is-the-day), and [Mastadon](http://equipboard.com/band/mastodon), he shows his Fractal Axe-Fx II Guitar Effects Processor. "The Ax-Fx II for me is all about the most amount of options on stage and in the studio for the absolute least amount of space, unreliable technical hassle, and cost." - [Zach Filkins](http://www.fractalaudio.com/artists.php). In the video @6:00-6:15 Noodles mentions that Dexter has his sounds stored in his Axe FX and Noodles has Dexter's sounds stored in his. In the whole video Noodles discusses the convenience and consistency of the Axe-FX. 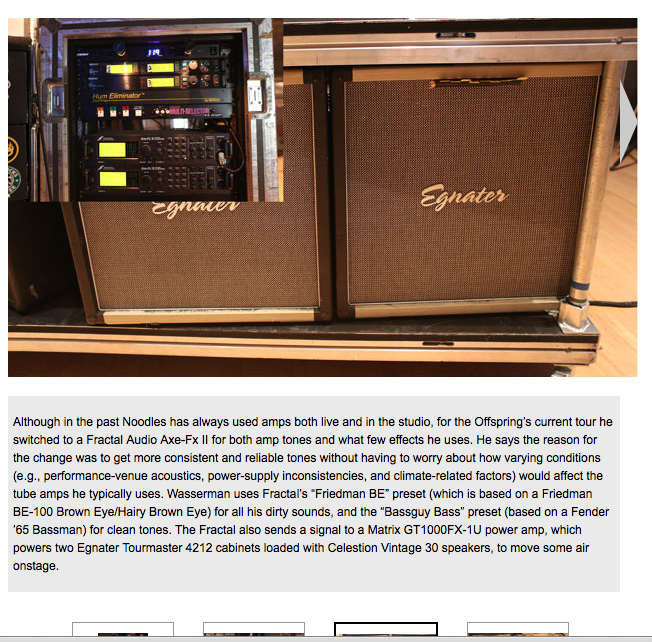 Kevin Wasserman uses a Fractal Axe-Fx II, according to [this](http://www.premierguitar.com/articles/22510-rig-rundown-the-offsprings-kevin-noodles-wasserman) rig rundown. In this rig rundown video Ler shows his live rig, including the Fractal Axe-Fx II at 14:26. "You can play the Axe-Fx and simulate amps to the degree to which I can't tell the difference," says Gavin Rossdale, at 0:30 in this video. "That runs into my Fractal Audio Axe-FX II, which is just an amazing unit. With the new updates which allow what's called scene controls I've actually only got to use one preset for the whole show that we do," says Nolly, in this rig rundown, at 8:30. Stephan Carpenter shows his Fractal Axe-Fx processors at 3:30 in this rig rundown video. In [this article](http://www.emusician.com/artists/1333/deftones--modeling-for-mayhem/45321), the following is written about Deftness and their use of Fractal Audio Systems: "But regarding the recording process, the real game changer was Fractal Audio Systems Axe-FX II Preamp FX Processor. 'The Deftones have always had a futuristic element to their sound, but it’s not as prevalent on the last record,' Rasculinecz says. '[This time] we started with brand-new sounds from Fractal Audio, which was a big sonic shift for the band. It’s the first record where Stephen hasn’t used the same amp and cab as on every record before. That alone lent itself to creating a fresh take on the music. Fractal opened up a whole new world of sonic elements that we didn’t have on the last record and it really took Stephen and Sergio out of the box.'" A 33:18 you can see the Axe FX in the rack. In an interview with Premier Guitar Dweezil Zappa's setup, which includes two Fractal Axe-Fx II Guitar Effects Processors, is discussed here: "The heart of Dweezil's tone comes from a Fractal Audio Systems Axe-FX II. In previous versions of his rig he actually ran two units simultaneously due to the CPU demand that his custom presets required. However, on this “Zappa Does Zappa” tour he runs everything through the top unit and the bottom is used as a backup or for any guests that might sit in. In order to recreate his father's famous tones, Dweezil goes back to the master tapes to study and cop every little detail in order to program the Axe-FX II presets." "There's nothing like the real sound of an amplifier... But now it's starting to become that there is"
"The top unit is an Axe-Fx 2 that we’re using as a backup. The middle one is Jari’s Axe-Fx Standard and on the bottom is my Ultra." On Rig Rundown Tom and Jim explain they were introduced to Axe FX and have started using them live so they can spend more on production costs and less on hauling lots of gear around. "I've been a tone purist and gear snob my whole life and was recently introduced to the Axe-Fx II - to say I was impressed is an understatement! It's replaced my 20k/800 pound rig. I'm sold - an amazing intuitive tone machine!" "I’ve also got a Fractal Axe-FX II in the studio and a Fractal AX8 that I take out on the road. I’ve been using it for almost two years. Our sound man really loves it too. Every time we do a sound check, I go last because all he does is turn the faders up and gives me the thumbs up [laughs]. He doesn’t have to change anything. I just plug it in and it sounds like I’ve got the best amps and effects with no buzz, hum or loss of tone. I can’t say enough about it." At 13:50 of this episode of "RIGGED" from the Gear Gods YouTube channel, Mike "Rickshaw" Martin lightens up the mood and gives us a tour of the latest rig he used for the Allstars Tour. He guides us through his rack unit which consists of a Hartke LH1000 Bass Amplifier, a Fractal Audio Systems Axe-Fx II Preamp / Effects Processor, an ART Pro Audio SP4x4 Pro Power Conditioner, a Tech 21 Sansamp RBI Rack Preamp, a Hartke HyDrive 810 Cabinet, and a Furman M-8Lx Power Conditioner. Metal-Rules.com: Could you tell me some info about your music gear? Ville: I have three main guitars: Amfisound custom Les Paul, Mayones Regius custom seven-stringed guitar and Caparison Angelus M3B. I’m currently endorsed by Caparison. Then various pedals: tube screamer, delays, reverb. Line6 and Eventide stuff mostly. For an amp, I’ve used Peavey 6506+. For a couple of years. We’re now going for AXE fx 2 to just get everything more simple, constant and compact for festivals and tours. Since Born of Osiris times, Jason is using Axe FX II. 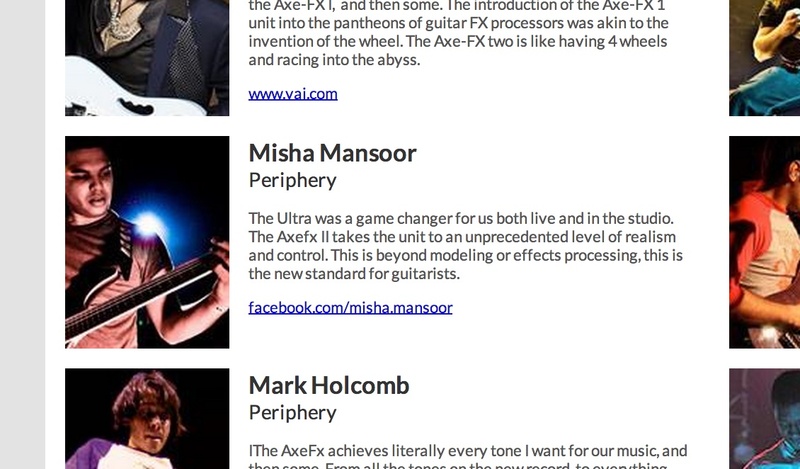 Jeff ha usato Axe fx nel periodo della registrazione di Zero Order Phase nel 2011. "I pretty much borrowed the rig from Tosin [Abasi] and Javier [Reyes] of Animals As Leaders [laughs]. I actually used the Axe 2, which I also borrowed from a friend of mine. He had this cabinet set up with different things that were kind of interesting." In [this](http://www.guitargeek.com/robin-finck-nine-inch-nails-guitar-rig-and-gear-setup-2014/) gear diagram, of Robin Finck's Nine Inch Nails stage setup, a Fractal Axe-Fx II is listed. The Axe-Fx II can be seen at 1:10 of this "Rig Rundown" with *Premier Guitar*. Jerry says about this effects processor "I have one amp that I use throughout the whole set, that's for the main tone, and then you know I have different presets I'm actually on to where they have the scenes now so I have one preset for each song." At 26m52s of this video for Premier Guitar, you can see Zach telling that he is not using effect pedals anymore, he is using only his new Fractal Axe-Fx 2. Kellen starts talking about his Axe Fx at 2:12. 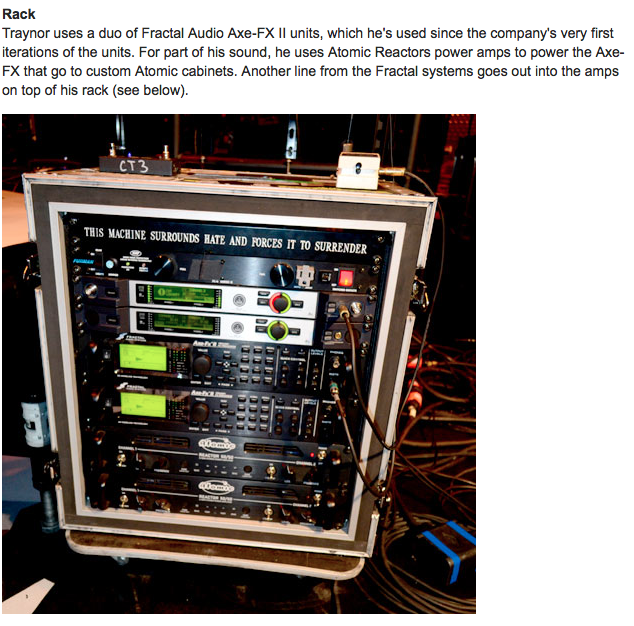 According to Premier Guitar's rig rundown, Brubaker uses two Fractals : with one of them being the Axe Fx II. Sitting on top of Plini's desk is an Axe-Fx II. He uses this in this teaser video. On his website Tom list this piece of gear too. In this photo, which partially shows Linder's rack units, the Fractal Axe-Fx II can be seen above his amplifier. In this video clip at 0:25, Sugizo can be seen using a Fractal Axe-FX II for his solo DOMMUNE performance. "La señal sale del Axe fx y se divide en dos. Una va L y R directo al PA (las bocinas que escucha el público) y la otra sale en Mono directo a un ampli Orange que tengo en el escenario e igualmente microfonedo para el PA. Este case más mis dos guitarras es son lo único que viajó y el resto se renta por cuestiones de simplicidad, practicidad y ahorro al empresario. Después de 10 años de estar comprando, vendiendo y calando equipo a prueba y error he encontrado que esto es lo que mejor me funciona a mi. Siempre tuve un Rig complicado con muchos cables en vivo y sufría de problemas técnicos por lo menos 2 veces cada show. La comodidad y versatilidad que me ha brindado el Axe ha sido como una bendición. Me la Pase meses haciendo pruebas en venues con mi Rig anterior y definitivamente este Setup sonaba mejor. Todos los presets fueron creados por mí en casa emulando mi Rig anterior con el Profiling y IR's y fueron tweakeados conforme pasaban los shows"
"Everything I do recording wise for Guitar and Base tones come from this"
Only used on material from Muse until now. Polyphia were fully POD farm on their EPs. Julia posted a photo of a Fractal Axe-Fx II onto her Facebook account. According to Premier Guitar's interview, one of the items Brown uses is the Fractal Axe-Fx II guitar processor. In this video he's comparing his BIAS with his Axe FX, "Today, we compare two of my favorite amp sims! Both are amazing, but we'll see how they stack up!!". At the beggining of the video you can see it. Steve is seen with his Fractal Axe-Fx II XL+ in the video "BIAS vs AXE FX 2." Used in his Nerve Studios production setup as a preamp and effects processor. 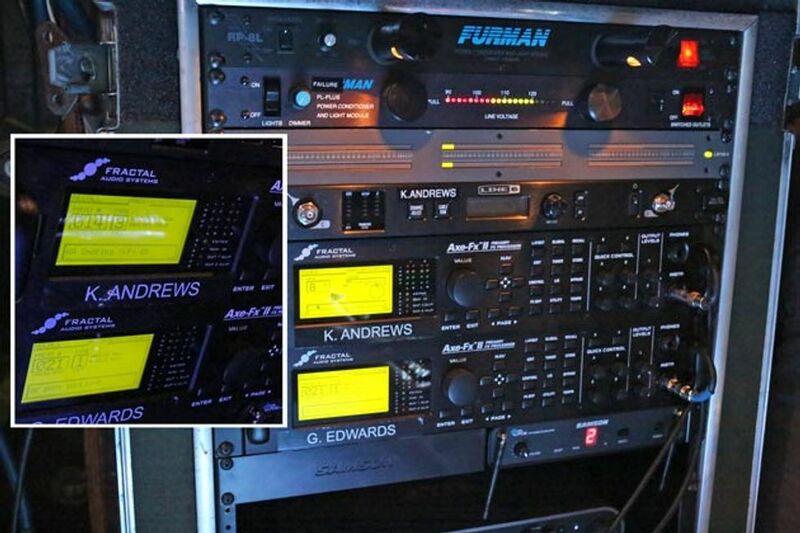 Sebastien used the Fractal Axe-FX II effects processor during the TOFTT World Tour. An Axe FX II can be seen in the rack in the background of this Guitar Demo by Angel Vivaldi. Nick: What kind of gear/equipment do you use in studio/live? Tymon: Paul and I use Steinberger guitars going through a Fractal Audio Axe-FX for amp modeling and effects. Pretty much the simplest setup you can have in the world of guitar. In an Instagram post made by Ichika on October 16th, 2017, his rig is shown to consist of a Fractal Axe-FX II going direct to the FOH. If you have a good understanding of signal chains and frequencies the axe fx will do you wonders. If you dont know what your doing you may get fustrated with. Its great for recording and live use. Some people dont think its $2000 better than other affordable effects/processors (the pod hd500 and the boss gt 100 to be exact) but any real professional will tell you there is a noticeable difference in sound and feel. I'd use it to record a variety of guitar samples. The Axe-Fx allows me, as a musician, to have complete control over my tone and to create any sound I want. It's pretty much a box of inspiration. 99% of the time I use the Axe-FX. Just to put some context on that, I have 11 tube amplifiers in the studio... from a '69 Superlead, CAA-PT-100, a collection of Dr Z and 65 Amps boutique amps, and some Mesa Boogie amps that I've modded myself. The Fractal is just so convenient and convincing. finally someone with a real superlead reviews the Fractal! thanks man. I am reall picky about 4 holer sounds having owned, toured and recorded with a number of them, all with their own special flavors and I just never hear anything but a well made clone copping any of those sounds convincingly, but I never see a Fractal in person around here to try one.... do you use the cab impulses or run it into a power amp driving a cab? Hi Jim. Well, I never use the Axe-FX live - I prefer to drag a head and cab. In my studio, however, the Axe-FX II gets me 99% of the way there in just seconds. I'm using TAF and OwnHammer IRs straight to the DAW (usually SPDIF). I highly recommend the Fractal Axe-Fx II I use it for recording and live. this is my secret weapon for sure!